Holy endeavors in the Middle East have brought many of the fighting class of Europe to it’s threshold. Pious men, not runaway surfs or merchants, they fight with the spirit of the Lord for whomever they fight. 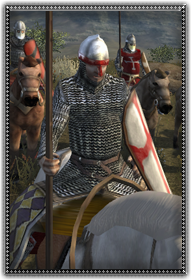 They also bring the favorite knightly tactic, the lance change, to the enemies of the east.